this is me going AAAAAARGH because it’s twenty past ten in the evening on a Thursday and I still haven’t finished a book this week. Luckily I got myself a safety net; a safety net in the form of a poem that is the entirety of a 25-pages booklet. This review will most definitely be longer than the book. OH WELL. I’ve been insanely busy recording and moulding and working, so cut me some slack. Bilbo’s last song is a poem that he sings as he is about to leave Middle-earth, in which he says goodbye to the life and friends he leaves behind. It’s a bittersweet thing to read, because you remember those very first steps Bilbo took when he left the Shire (without a handkerchief!) when he was fifty. We travelled with him all the way there to the Lonely Mountain and back again to Lobelia and her spoons, and then we continued – we feared the nameless black riders, we laughed with Bombadil, we saw elvish wonders and the darkest places, we found courage on the paths of the dead- and we returned home, even if we had to fight a fallen wizard at the very end to save it. To realize this journey is over is so heart-breaking I often can’t finish it without crying my little heart out. But here he stands, eighty years after he stepped out of his Hobbit-hole, on the tranquil shores of the Grey Havens. And he remembers. He remembers all. But you know what? You can also feel how much he’s looking forward to this new adventure, just over the western horizon. And now over to some less sentimental speculation. Bilbo had the One Ring for sixty years, and this must have enlarged his ambition somewhat (see my Two Towers review where I explain its power). What does Bilbo want? What are his desires through The Hobbit and The Fellowship that The Ring might’ve enhanced? Well, that’s easy- in The Hobbit Bilbo keeps going on about how he misses his hobbit-hole. And in The Fellowship he wants to go on a new adventure, because he wants to see the mountains again. Sixty years of having this Ring and this is the only damage it has caused? This just proves how strong Bilbo’s will was. The fact that Gandalf managed to make him pass it over to Frodo illustrates my point. 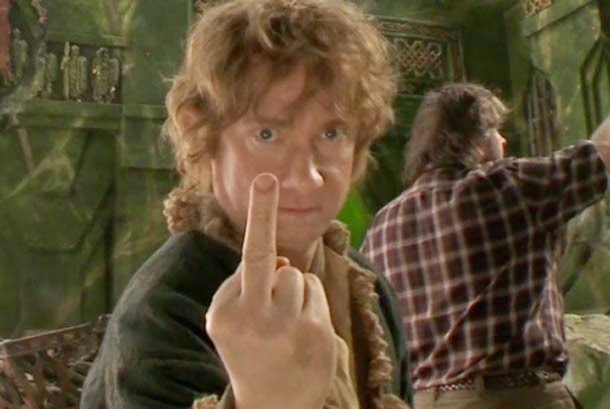 Bravo brave, little Bilbo. I hope he somehow had the chance to sit next to Manwë, Lord of the gods. That image would have been comical.